Clairglow’s Chosen Charity for 2019 is Chasing Connor’s Cure who are a local charity raising funds for Duchenne Muscular Dystrophy. On the 7th June 2019, Clairglow employee Paul Hollobon will be taking part in the Duchenne Dash, a gruelling 24 hour, 300k cycle ride from London to Paris. We are delighted to be sponsoring the Chasing Connor’s Cure team and will be supporting and encouraging Paul in his training in the lead up to this challenge. We would like to introduce you to Connor – a gorgeous, boisterous, fun loving, fancy dress wearing and rather loud 5-year-old boy. In February 2016, Connor was diagnosed with a form of Muscular Dystrophy called Duchenne. Duchenne muscular dystrophy (DMD) is a rapidly progressive form of muscular dystrophy that occurs primarily in boys. Children who have DMD, such as Connor, have progressive loss of muscle function and weakness, which begins in the lower limbs. By age 10, braces may be required for walking, and by age 12, most boys are confined to a wheelchair. Sadly, the current life expectancy for boys with Duchenne is not good with few living beyond their 30s. 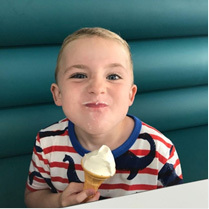 To raise vital funds for Team Connor we have “delegated” Clairglow employee Paul Hollobon, the gruelling task of taking on the Duchenne Dash on 7th June 2019. This is a monster challenge and involves a 24 hour gruelling 300k bike ride from London to Paris. Yes that’s right – 300k in 24 hours! The Chasing Connor’s Cure Team (including Paul) are local mums, dads, friends and family of Connor who are determined to make a difference to Connor’s life and boys like him.